For other uses, see Debenham (disambiguation). Debenhams is a British multinational retailer operating under a department store format in the United Kingdom and Ireland with franchise stores in other countries. The company was founded in the eighteenth century as a single store in London and has now grown to 178 locations across the UK, Ireland and Denmark. It sells a range of clothing, household items and furniture and has been known since 1993 for its 'Designers at Debenhams' brand range. Headquartered in Regent's Place in the London Borough of Camden. The company owns the Danish department store chain, Magasin du Nord, and has a subsidiary in Ireland. The business was formed in 1778 by William Clark, who began trading at 44 Wigmore Street in London as a drapers' store. In 1813, William Debenham became a partner and the corporate name changed to Clark & Debenham. The shop was later renamed Cavendish House and carried drapery, silks, haberdashery, millinery, hosiery, lace and family mourning goods. As the trade grew, the partners determined to expand the business by opening provincial branches in Cheltenham and Harrogate. By 1823, Clark & Debenham had opened a small drapery business at 3 Promenade Rooms, Cheltenham, selling a selection of silks, muslins, shawls, gloves, lace and fancy goods. The new shop flourished. In 1837, Clark retired from the business and Debenham assumed two of his most trusted staff, William Pooley and John Smith, as partners, trading in both London and Cheltenham as Debenham, Pooley & Smith. By 1840, the management of the Cheltenham branch appears to have been given to Clement Freebody, Debenham's brother-in-law. Around 1843, another branch shop was launched in Harrogate. Extended and refurbished premises opened in Cheltenham in October 1844. Pooley and Smith retired from the business in 1851 when Debenham took his son, William, and Clement Freebody into partnership, trading as Debenham, Son & Freebody. At this time all three shops in London, Cheltenham and Harrogate were trading in similar goods and issued a joint catalogue, called the Fashion Book, that was the basis of an extensive mail-order trade. In 1876 when Freebody retired, a new partnership, Debenham & Hewitt, was formed. George Hewitt appears to have worked at the Cheltenham store as a draper's assistant during the early 1860s but details of his subsequent career are not known. By 1883, George Hewitt was the sole owner of the Cheltenham business, Frank and William Debenham having withdrawn to manage the London store as a separate concern. Crypt Chambers in Chester houses part of the Browns of Chester store and is a Grade I listed building. The business was incorporated as Debenhams Limited in 1905. The modern Debenhams group grew from the acquisition of department stores in towns and cities throughout the UK, under the leadership of its chairman, Ernest Debenham. The first of these purchases, Marshall & Snelgrove at Oxford Street in London, was acquired through a one sided merger in 1919. 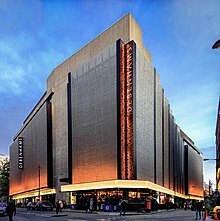 Later purchases included Harvey Nichols in London's Knightsbridge in 1920. Most of the acquired stores retained their former identities until a unified corporate image was rolled out. The company was first listed on the London Stock Exchange in 1928, shortly after it had purchased fellow retail group Drapery Trust. In 1976 the company acquired Browns of Chester. It remains the only UK store to have retained an individual identity. The business diversified during the 1970s buying South East based supermarket group Cater Brothers in 1972, after the death of its chairman Leslie Cater. Using the new purchasing power Debenhams modernised its 40 food halls within its stores, branding them Cater's Food Halls, and opened two new Cater superstores. However the business declined in the intense marketplace and in 1979 the chain was sold to Allied Suppliers who converted the Cater stores into their Presto format. Debenhams was targeted three times during the 1980s by the Animal Liberation Front in protest at the sale of animal furs in stores. Stores in Romford, Luton, and Harrow were fire-bombed by members, the worst attack being on the Luton store. As a result, the company stopped selling clothes with animal furs. It was alleged by Caroline Lucas MP in a debate in Westminster Hall that Bob Lambert, a then undercover police officer, planted the fire bomb that caused £340,000 worth of damage to the Harrow branch of Debenhams in 1987. It is unclear if anything has come of these allegations as of March 2014. In 1985 the company was acquired by the Burton Group. Following the closure of the store in Dudley in January 1981 and the Birmingham store in 1983, the company's only store in the West Midlands for the next six years was a town centre store in Walsall. On 4 November 1989, it opened a store at the Merry Hill Shopping Centre in Brierley Hill. Debenhams demerged from the Burton Group in January 1998 and was once again listed as a separate company on the London Stock Exchange. It expanded under the leadership of Belinda Earl who was appointed CEO in 2000. Debenhams opened its largest British store on 4 September 2003, at the new Bull Ring shopping centre in Birmingham. The new store contains 19,230 sq m and opened 20 years after the company closed its Birmingham city centre store due to declining trade. A private consortium named Baroness Retail Limited acquired the company in November 2003, and it returned to a listing on the London Stock Exchange in 2006. The consortium comprised CVC Capital Partners, Texas Pacific Group, Merrill Lynch Global Private Equity, and management. The company purchased the brand name and stock of Principles in March 2009 after the business entered administration. Principles operated concessions within 121 Debenhams stores, and was subsequently relaunched by Ben de Lisi as part of the Designers at Debenhams range. In November 2009, Debenhams acquired the Danish department store group Magasin Du Nord for £12.3 million. The company operates six stores in Denmark under the Magasin brand. In July 2010 Debenhams purchased the 115 Faith concessions trading within its stores, after Faith entered administration. In April 2012 the company announced it would be building 14 new stores, and was in negotiations over a further 25 sites in the UK. Debenhams agreed to become the anchor store at the Riverside shopping centre in Shrewsbury. By September 2012, the company announced that like-for-like sales had risen by 3.3% in the six months up to that date. Debenhams moved to a new headquarters in 2013, in Brock Street, London. The company moved to a new building, built by British Land in Regent's Place. The company leased 174,500 square feet (16,000 m2) of office space from British Land for 25 years. The company began a refurbishment of its flagship store in Oxford Street in 2013, which involved the installation of 180,000 aluminium tiles on the exterior of the building that appears to ripple with the wind. An existing floor was also converted to become a trading floor. The total cost of the refurbishment was in the region of £40 million, of which Debenhams contributed £25 million. The owner of the building, British Land, also contributed towards the cost. The refurbishment is due to be completed by February 2014. The company's trading statement for the 17 weeks up to 28 December 2013 was released on 31 December 2013, and revealed a reduction in pre-tax profit from £115 million to £85 million. On 2 January 2014, the company's chief financial officer Simon Herrick resigned, following criticism of his financial decisions. On 13 January 2014 4.6% of Debenhams shares were bought by Sports Direct, the retailer run by Mike Ashley. The stock market purchase of 56.8 million shares (worth around £46m) was made without the prior knowledge of the Debenhams board. Sports Direct stated at the time it intends to be a supportive share holder. The Debenhams board responded by stating they are open-minded with regard to exploring operational opportunities to improve its performance. Sports Direct sold its shares on 16 January 2014, although they took out an option to buy further shares up to a total of 6.6%. In August 2017, it emerged that Ashley had secured 21% of the shares which gave him over 10% of voting rights in the company. During 2017 Debenhams opened two new stores, one in Stevenage and one in Wolverhampton. The 80,000 sq ft Stevenage store was opened on 24 August 2017 at Roaring Meg Retail and Leisure Park by Celebrity fashion designer Julien MacDonald and local hero Jean Robinson, who had won a competition for the privilege. The store is the first to be designed under the vision of CEO Sergio Bucher, with a new layout and format with the emphasis on encouraging people to stay longer. The second store to open during 2017 is the new 93,000 sq ft store at Wolverhampton's Mander Centre. The store was opened on 12 October 2017 as part of the centre's £35 million refurbishments, it is also Debenhams' first store in Wolverhampton. It is only the second to feature the new layout previously only seen in the Stevenage store, and only the second to feature the companies new deli-restaurant format Loaf & Bloom, only previously seen at Milton Keynes. In February 2018, the company announced a reduction of up to 320 store management roles across the business by the end of March. Sports Direct increased its holding in the company to 29.7% on 2 March, just below the level whereby it would be required to submit a formal takeover approach. After considerable media speculation about Debenhams' survival, the company announced the largest loss in its history, a pre-tax loss of £491 million, and the closure of up to 50 stores with the potential loss of 4,000 jobs. On 9 April 2019, the company announced that they had gone into pre-pack administration. In 1993 the company introduced the 'Designers at Debenhams' brand, the creation of then CEO Belinda Earl, Ben de Lisi and Spencer Hawken. The idea put designer names and brands at High Street prices, including Jasper Conran, John Rocha, Butterfly by Matthew Williamson, H! by Henry Holland, Star by Julien Macdonald, Frost French, Janet Reger, Ted Baker, St George by Duffer, Jeff Banks, and Ben de Lisi. The company also sells goods under a number of brand names that it owns. In 2010, Debenhams announced the launch of four new designer names to its fashion range; Jonathan Saunders, Preen, Jonathan Kelsey, and Roksanda Ilincic. Stores also contain concessions whereby other retailers may trade. Brands in stores include Oasis, Coast, Phase Eight and Warehouse. In June 2014, the company announced a trial of Sports Direct concessions in its Harrow and Southsea stores, which if successful would be expanded to other stores. This followed the purchase of a stake in Debenhams by Mike Ashley, the owner of Sports Direct, in January 2014. Later that year, Debenhams also launched trials of Costa Coffee and Mothercare concessions within stores. In October 2016, the company announced it would begin to focus less on clothing and more on food, beauty products and gifts. It also hired the former lighting buying team of collapsed rival BHS to begin introducing new lighting departments in stores. Debenhams followed this in December 2016 with a plan to discontinue its Betty Jackson Black ladies fashion brand, and significantly reduce its Jeff Banks menswear range in favour of expanding the Hammond & Co. brand. The company operates retail websites in the UK and Ireland, as well as a mobile-enabled website and mobile apps that allow customers to shop the online range and scan product barcodes in store. Debenhams provide store card and credit card services, operated by NewDay. Insurance products are also provided under the Debenhams brand by other financial companies. Debenhams also operate bureaux de change in selected stores. The company also operates a loyalty card programme, branded the Debenhams Beauty Club, where customers can collect points with the purchase of health and beauty products. Bobby & Co. Bournemouth, Eastbourne, Exeter, Folkestone, Torquay etc. Bought 1928 as part of Drapery Trust. Bon Marché Gloucester Bought 1928 as part of Drapery Trust; Rebranded 1971. Browns of Chester Bangor, Chester Bought 1975. Busbys Bradford Bought 1958. Rebranded 1973. Closed 1978. Corders Ipswich Merged with Footman Pretty when the current store was built. Drages High Holborn & Birmingham Bought 1928 as part of Drapery Trust. Elliston & Cavell Oxford Bought 1953. Footman Pretty Ipswich Merged with Corders once the current store was built. Griffin & Spalding Nottingham Bought 1944. Kennards Croydon & Staines Bought 1928 as part of Drapery Trust. Marshalls Ltd Bought 1928 as part of Drapery Trust. Marshall & Snelgrove Oxford Street, London, etc. Merger 1919. Pauldens Manchester, Sheffield Bought 1920. Plummer Roddis Bournemouth, Brighton, Hastings, Southampton, Guildford etc. Matthias Robinson Leeds, Stockton-on-Tees Bought 1962. Swan & Edgar Piccadilly Circus Bought 1928 as part of the Drapery Trust. Woolland Brothers Knightsbridge Bought 1949. Closed 1967. The Debenhams brand is used for stores operating under licence in 26 other countries. These are Armenia, Australia, Bahrain, Bulgaria, Croatia, Cyprus, Czech Republic, Egypt, Estonia, Hungary, Iceland (closed as of 2017), Indonesia (closed as of 2017), Iran, Jordan, Kazakhstan, Kuwait, Latvia, Malaysia, Malta, Pakistan, Philippines, Qatar, Romania, Russia, Saudi Arabia, Turkey, United Arab Emirates, and Vietnam. The company announced in January 2013 that it planned to increase the number of international franchise stores to 150 within 5 years. In late 2015 it was announced that Debenhams had acquired all seven Stockmann stores in Russia. ^ a b c d e "Preliminary Results 2018". Debenhams plc. Retrieved 26 October 2018. ^ "History of Debenhams". Debenhams. Retrieved 14 September 2013. ^ a b c "Cavendish House Co Ltd". House of Fraser Archive. Retrieved 3 April 2016. ^ "Business History of Department Stores: Interesting Dates". KIPnotes. 1 October 2008. Archived from the original on 26 December 2009. Retrieved 22 February 2012. ^ a b c "History". Debenhams. Retrieved 22 February 2012. ^ "Drapery profits". The Spectator. 27 July 1928. Retrieved 30 October 2014. ^ "Cater Brothers". Retrieved 17 April 2015. ^ a b "Undercover policeman 'fire-bombed shop,' MPs told". BBC News. 13 June 2012. Retrieved 10 March 2014. ^ "MP Caroline Lucas names undercover officer as shop fire bomber". BBC News. 13 June 2012. Retrieved 10 March 2014. ^ "Undercover cop alleged to have fire-bombed Debenhams for ALF". Constabulary. 13 June 2012. Archived from the original on 10 March 2014. Retrieved 10 March 2014. ^ "Caroline Lucas Exposes Allegations Ex-Undercover Cop Bob Lambert Firebombed Debenhams London Store". The Huffington Post. 13 June 2012. Retrieved 10 March 2014. ^ "The Robin Hoods of Merry Hill". Management Today. 1 November 1991. Retrieved 7 October 2014. ^ "New look for Debenhams". BBC News. 27 April 1998. Retrieved 12 August 2013. ^ Jane Martinson (14 December 2006). "The Queen of Retail makes a dull brand shine". The Guardian. Retrieved 22 February 2012. ^ "Bullring opens its doors". BBC News Online. 4 September 2003. Retrieved 22 February 2012. ^ "Bullring Information Pack" (PDF). Bullring Alliance. 2003. Archived from the original (PDF) on 19 March 2012. Retrieved 22 February 2012. ^ "Debenhams backs Baroness takeover". BBC News. 10 November 2003. Retrieved 12 August 2013. ^ "Debenhams shares rise on listing". BBC News. 4 May 2006. Retrieved 12 August 2013. ^ Alastair Jamieson (7 March 2009). "Fashion chain Principles to close 66 stores and axe majority of staff". Daily Telegraph. Retrieved 5 October 2012. ^ Ester Bintliff (12 November 2009). "Debenhams steps into mainland Europe". Financial Times. Retrieved 12 August 2013. ^ "About Debenhams". Debenhams. 2013. Archived from the original on 19 January 2013. Retrieved 15 January 2013. ^ Rosie Baker (2 July 2010). "Debenhams has faith in shoe chain". Marketing Week. Retrieved 5 October 2012. ^ "Debenhams profit edges higher in 'difficult' trading". BBC News Online. 19 April 2012. Retrieved 7 October 2012. ^ "Debenhams to be Shrewsbury shopping centre 'anchor tenant'". BBC News Online. 19 April 2012. Retrieved 7 October 2012. ^ "Debenhams sales rise as profits 'set to grow'". BBC News Online. 18 September 2012. Retrieved 7 October 2012. ^ "Debenhams to Take Additional Space at British Land's Regent's Place". British Land. 1 May 2012. Retrieved 27 July 2013. ^ Jonathan Prynn (11 June 2013). "Debenhams to dazzle Oxford Street with 180,000 shiny tiles". Evening Standard. Retrieved 27 July 2013. ^ "British Land Unveils Revolutionary Facelift for Debenhams Oxford Street Flagship". British Land. 11 June 2013. Retrieved 27 July 2013. ^ "Debenhams warns on Christmas sales". BBC News. 31 December 2013. Retrieved 2 January 2014. ^ Titcomb, James (2 January 2014). "Debenhams finance boss quits days after major profit warning". The Telegraph. Retrieved 2 January 2014. ^ "Sports Direct buys 4.6% Debenhams stake". BBC. 13 January 2014. Retrieved 13 January 2014. ^ "Sports Direct nets 5% stake in Debenhams". Sky News. 13 January 2014. Retrieved 13 January 2014. ^ "Sports Direct takes option on Debenhams stake". BBC News. 16 January 2014. Retrieved 16 January 2014. ^ "Mike Ashley increases Debenhams stake to more than 20pc", The Telegraph, 22 August 2017, accessed 19 November 2017. ^ JP Asher (24 August 2017). "Stevenage Debenhams opens as glamour king Julien Macdonald and community hero Jean Robinson cut the ribbon | Stevenage, Hitchin, Letchworth, Biggleswade News". The Comet. Retrieved 23 May 2018. ^ "Debenhams Wolverhampton: Thousands flock to opening of new city store". Express and Star. 13 October 2017. Retrieved 24 May 2018. ^ Chapman, Ben (8 February 2018). "Debenhams to slash up to 320 store management jobs in cost-cutting drive". The Independent. Retrieved 2 March 2018. ^ Megaw, Nicholas (2 March 2018). "Sports Direct lifts Debenhams stake to almost 30%". Financial Times. Retrieved 2 March 2018. ^ "The 'perfect storm' facing Debenhams". News.sky.com. 1 January 1970. Retrieved 26 October 2018. ^ "Debenhams to shut up to 50 stores as 4,000 staff face redundancy". Belfast Telegraph. 25 October 2018. Retrieved 26 October 2018. ^ Butler, Sarah (9 April 2019). "Debenhams is taken over by lenders as Mike Ashley loses £150m stake". The Guardian. ISSN 0261-3077. Retrieved 9 April 2019. ^ "Designers at Debenhams". Debenhams. Archived from the original on 1 March 2012. Retrieved 22 February 2012. ^ "Own-brand names rings the till for Debenhams as profits jump". 17 October 2009. Retrieved 17 April 2017. ^ "Four new designers join Debenhams for 'Edition'". Debenhams blog. 21 October 2010. Archived from the original on 24 July 2011. Retrieved 22 February 2012. ^ Ruddick, Graham (20 June 2014). "Debenhams to open Sports Direct concessions". Daily Telegraph. Retrieved 7 September 2014. ^ Chapman, Matthew (20 June 2014). "Debenhams to open Costa coffee shops as it taps brands for hospitality push". Marketing Magazine. Retrieved 22 February 2015. ^ Wood, Zoe (6 October 2014). "Debenhams gives Mothercare floor space to make stores more appealing". The Guardian. Retrieved 22 February 2015. ^ Ough, Tom (27 October 2016). "Debenhams profits slip as it looks to shift away from reliance on clothing". The Telegraph. Retrieved 29 October 2016. ^ Butler, Sarah (27 October 2016). "Debenhams targets BHS customers with new lighting departments". The Guardian. Retrieved 29 October 2016. ^ Armitage, Jim (19 December 2016). "Debenhams shakes-up long-standing fashion designer partnerships". Evening Standard. Retrieved 31 December 2016. ^ "Shopping goes truly mobile" (Press release). Debenhams. 16 September 2011. Archived from the original on 30 November 2011. Retrieved 22 February 2012. ^ "Beauty Club". Debenhams. Retrieved 17 April 2017. ^ "Stores". Debenhams plc. Retrieved 19 January 2015. ^ "Roches Stores v Debenhams: So who are the Roche family?". The Independent. 26 May 2016. Retrieved 17 April 2017. ^ "International Franchise Stores". Debenhams plc. 2013. Retrieved 11 August 2013. ^ "Lotus, Debenhams in Indonesia to close down by year's end". The Jakarta Post. 26 October 2017. Retrieved 3 January 2018. ^ Chris Irvine (16 December 2008). "Debenhams 'to open first store in Iran". Daily Telegraph. Retrieved 22 February 2012. ^ "Debenhams launching Malta recruitment drive". The Times. Times of Malta. 13 July 2009. Retrieved 22 February 2012. ^ Nastassia Astrasheuskaya (5 October 2012). "Debenhams has high hopes for Russia". Reuters. Retrieved 11 August 2013. ^ "Interim Management Statement". Debenhams plc. 8 January 2013. Retrieved 15 January 2013. Wikimedia Commons has media related to Debenhams.